Tafline Laylin, managing editor of the Green Prophet blog, recently interviewed ECSP Director Geoff Dabelko about the just-released U.S. intelligence assessment on global water security and what it says about the Middle East. The conversation touched on regional water scarcity, Palestinian-Israeli water tensions, and the role of the international community. Green Prophet: So, for context, can you say a little bit about the National Intelligence report and why it was compiled? Geoff Dabelko: The water and security assessment from the National Intelligence Council was done at the request of Secretary of State Hillary Clinton. The National Intelligence Council has a strong history of looking at long term trends in the environmental, technological, demographic realms and working to understand how trends in these areas are and could be part of larger economic, political, and social dynamics that may pose national security issues for the United States. Green Prophet: There were seven river basins of particular concern, of which four are located in the MENA region: the Euphrates, Jordan, Nile, and the Tigris. Why do you think these are of particular importance? Geoff Dabelko: I do not explicitly know the criteria for their selection of the seven basins. But I think these four, like the other three, have some common characteristics. They are basins where the rivers are shared by two or more countries/territories that are heavily dependent on the waters; that have relations among the states that include uncertain, tense, or even overtly hostile relationships; that are now and/or likely to experience big growth in demand for the water resource based on both population growth and consumption growth, that at the same time there is concern that climate change will at least increase variability, timing, and or quantity of that water (both scarcity and abundance i.e. floods). And then the report focuses on the institutional river basin arrangements and differentiates among their assessed capacities for addressing these current and future stresses. That diversity aside, it is fair to say that the transboundary water institutions remain a priority yet a challenge for addressing the multiple dimensions of the water relationship. I say “multiple” given all the different uses water performs in most of these settings (transport, irrigation, hydropower, culture, industrial, household, etc). Continue reading on Green Prophet. 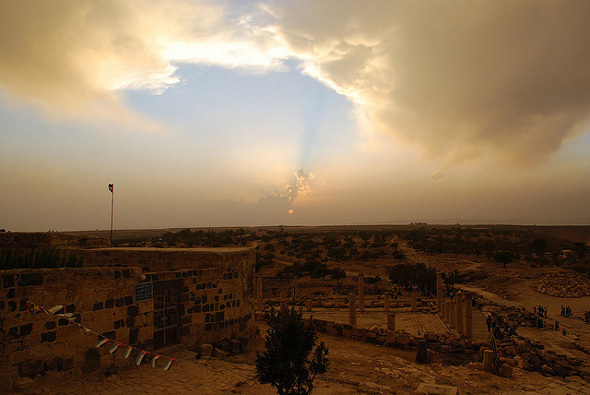 Photo Credit: “Umm Qais – Sunset,” courtesy of flickr user Magh. Andrea Gorzitze: Interesting. I always assumed that the government was financing these new villages. © Copyright 2007-2019. Environmental Change and Security Program. Woodrow Wilson International Center for Scholars. All rights reserved.